Nancy Peacock’s path to becoming a successful writer wasn’t normal but it was fun. She got interested in writing in the 4th grade when a teacher introduced her to the arts. "I loved books," she said. "I loved storytelling, but I didn't know that was something that adults actually did." She skipped college, choosing instead to marry her high school sweetheart. “Certainly by not going to college, I had to work. I was sort of thrown into the work-a-day world,” she said. After the end of her marriage, she embarked on a series of odd jobs, including drum maker, costumer, packer and horse-stall mucker. She eventually supported herself as a housekeeper while slowly gaining success in the publishing realm. She now supports herself by writing and by teaching others how to do it. 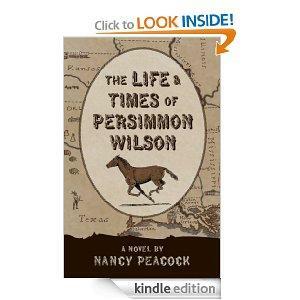 Her latest novel is called “The Life and Times of Persimmon Wilson” (Lystra Books/2013). "This book is in the voice of an African American man, an ex slave, who is about to hang for the murder of his former master," she said, adding later. "He does not dispute that murder." But he does dispute the characterization that he kidnapped the slave master's wife, arguing instead that the "wife" was a slave, forced to be with the slave master against her will. She will be reading from the novel at McIntyre's Books in Pittsboro at 11a.m. on Saturday.